About a month ago the church on the corner had a bless-the-animals ceremony. I went, along with my wife and son and Roxxy, the explicit beneficiary of the service. It was held outdoors on a sunny Sunday. Many people brought pictures of their pets — living and deceased. Only one other actual pet was in attendance, a fine old black-haired mutt named Ralph who is roughly five times the size of our Pug and considerably older. He had that fine white around the eyes and muzzle that tells you you are in the company of a dog who has seen quite a bit. Much to my own surprise I have gone back several times since then and have felt a distinct pang on those Sundays when family scheduling forced me to miss services. While I have spent a fair amount of time in church basements at various community meetings, I hadn’t been upstairs during a church’s prime hours of operation in many years. My last regular attendance ended 33 or so years ago. I was raised nominally Roman Catholic — which meant going on Easter and Christmas. Until junior high school when my mother and I moved into a charismatic Catholic parish — St. Patrick’s Word of God — in Providence, RI. We moved there because it was the best school my mother could find for me, not because of any particular fervent faith. My mother — Irish Catholic — had been a regular church goer until sometime in the 50s or maybe even the 1960s. But by the late 1960s I can’t remember anything more than that nominal attendance at services. It was quite confusing to suddenly be part of this community of people so fervent in their beliefs. We started going to Mass every week and the services themselves weren’t like what I slightly remembered. They seemed much longer, with people reading from the bible at times and, after communion, speaking in tongues. That was my favorite part. It was a harmonious discord, very like listening to an orchestra tune up. It went on for a while until the Holy Spirit had given up the ghost in the last person It had inhabited and then quiet returned and the services continued. I hadn’t really thought much about God in any manifestation prior to this. It was a concept that would get kicked around now and then by me and my friends. We weren’t particularly theologically minded. God was a topic that was discussed with far less passion than say whether you like Marvel or DC comics. (I was a Marvel kid). When it did come up it mostly seemed to consist of conversations like, “What do you think?” “I dunno but there’s gotta be, right?” “I dunno.” Things would go flat after that. This was never a problem I had when it came to the truly important debate: Who is stronger, Hulk or Superman? So St. Pat’s was really my first extended exposure to either God or religion (the two were the same in my mind then). We had to read the Bible a lot at St. Pat’s. I liked to read and wouldn’t have minded so much had it not been so badly written and horribly illustrated. The Bible they equipped us with was The Good News For Modern Man edition which was au currant in the early 1970s. The translation is very prosaic and seems to think that the way to connect with people is through the most stripped down writing imaginable. What truly baffled me about the four gospels was why there were four of them when they all sounded exactly the same. (And yes, this is actually what I thought in 6th grade. Precocious doesn’t begin to describe me.) 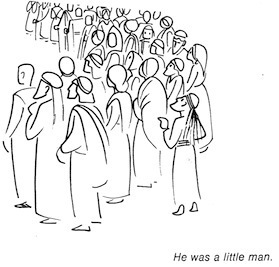 The illustrations were all these simplified line drawings that were as plain and flat as the prose. I learned to read from comic books and was in awe of artists like Jack Kirby who could make characters that indeed looked like gods if not God. 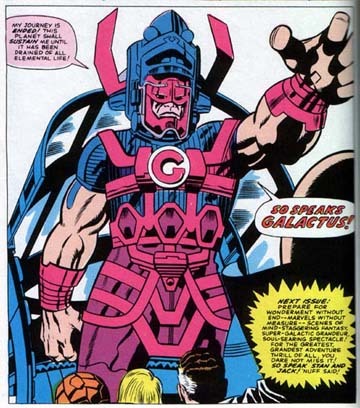 It is hard for a drawing like this to inspire awe in a child who has seen Galactus poised to destroy the earth in four colors. I am the child of writers and the grand child of painters and architects. I noticed all these things even then. The greatest sin to me as a child was being boring. And the Bible, such as I knew it, was guilty. It didn’t help that we only read the New Testament and the most boring parts of the Old. I loved history and battles and the Bible is certainly filled with that. However I don’t remember even getting to read that. Just more and more about getting nailed to a cross and the like. It was bloody, but not the explosions or sword fight type of bloody that I wanted. Being a kid like many others in some respects I tried to get into the swing of things. I would concentrate and try to hear the voice inside me. When people read from the Bible I would listen … at least until I got bored. My previous religious education was so spotty that I didn’t know I was supposed to say “Amen” before the priest gave me communion. On several occasions the priest and I would just stare at each other, he with the Host in his hand and me with cluelessness in my mind. After a while he would give in and give me the wafer which did indeed taste like paper. I remember one time at a small prayer service for all of us in the 6th grade saying I felt a presence. A hand on my shoulder. I do not know now if I actually felt it or if I was just trying to fit in. Now I want to say I felt something but at earlier times in my life I just as much wanted to say that I was just trying to fit in. I do not trust either memory. That said I never connected with Jesus. I could go along with the idea of God — something created everything was (and is) my thinking — but Christ seemed a little far fetched for me. I honestly asked that question for a brief while until the sneer of adolescence made it impossible to give any answer that wouldn’t discomfit my teachers and the priests.